Poisonous plants are not all made equal. Some are more poisonous to humans than others. Some toxins are faster acting than others. Some toxins have an effect when ingested, while others have an effect on contact with the plant. This should not, however, make you afraid of plants. Plants are not out to get you. Many toxins in plants have evolved to defend the plants from insect, pests and other predators. It’s just a case of becoming educated and learning to identify plants that may cause you harm if you ingest or touch them. In general, the most important plants to learn first are the most common. And with poisonous plants, the most important ones to learn first are the most common and widespread species that have significant ability to cause you some trouble. Below are ten plants to get you started with your knowledge of poisonous plants. All are common and widespread, with some resembling edible species. 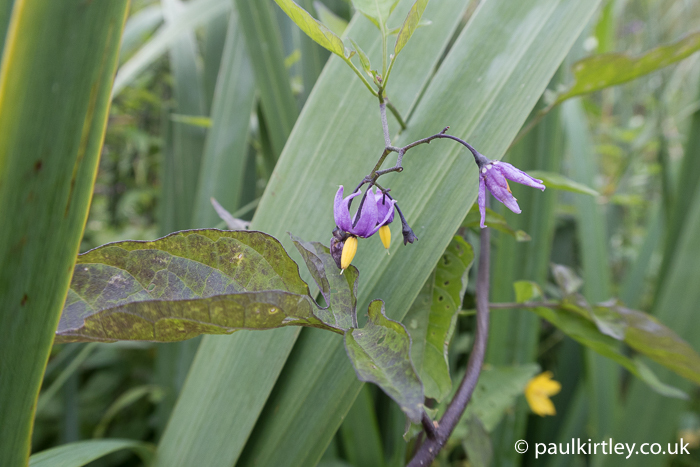 Also known as woody nightshade, this member of the nightshade family is much more common than its infamous relative deadly nightshade, Atropa belladonna and as such you are much more likely to come across it. Bittersweet is part of the Solanaceae family of plants which also includes tomatoes and potatoes. Bittersweet bears some common family resemblances to these in its flower and leaf shape. Bittersweet flowers are purple, with a yellow centre – very striking. The purple colouration is also present in other parts of the plant, most noticeably the stems of the fruits. 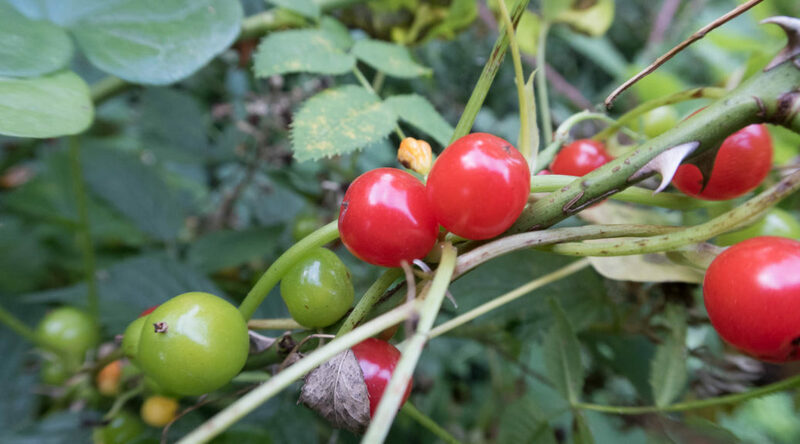 The fruits themselves resemble tiny, ovoid tomatoes, which start green and ripen to a full red. The fruits even smell like tomatoes but are poisonous to humans. The plant grows as a climbing vine in hedgerows and woodland edges. It particularly likes damp ground and can be seen amongst plants right on the edge of rivers. The fruit of bittersweet resemble tiny tomatoes but are poisonous to humans Photo: Paul Kirtley. Flowers of bittersweet by a river in Cumbria, UK. Photo: Paul Kirtley. This plant is a twining vine growing in hedges and amongst other plants such as brambles in the woods. 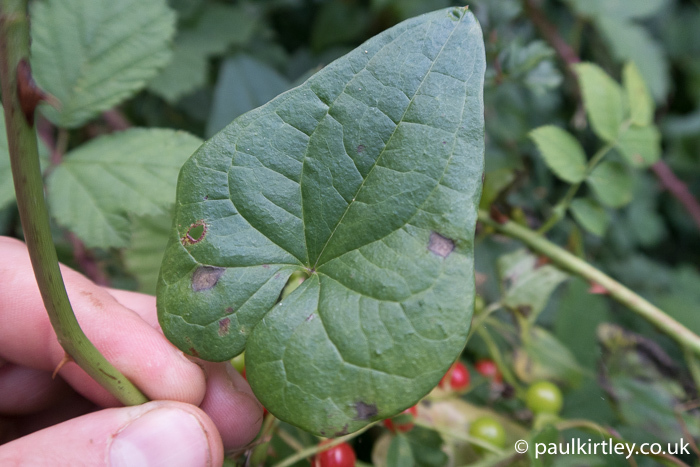 Black bryony is related to yams but is a long way from being edible, its starchy root being stuffed with high concentrations of toxins, including sharp calcium oxalate crystals. 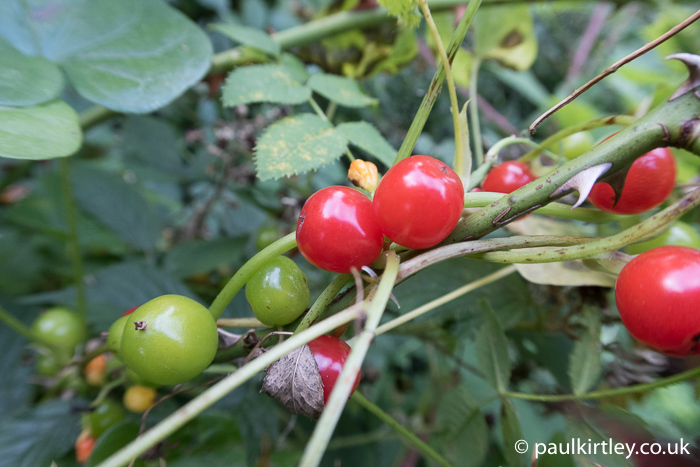 Black bryony is not so visible in summer but becomes more so in autumn and winter when its attractive red berries, which can stay on the vine right into winter, are more obvious. These berries are also poisonous. 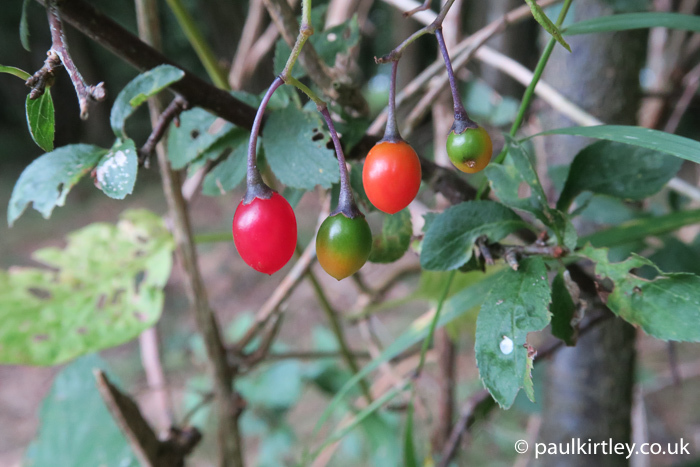 Fruits of black bryony. Photo: Paul Kirtley. Leaf of black bryony. Photo: Paul Kirtley. 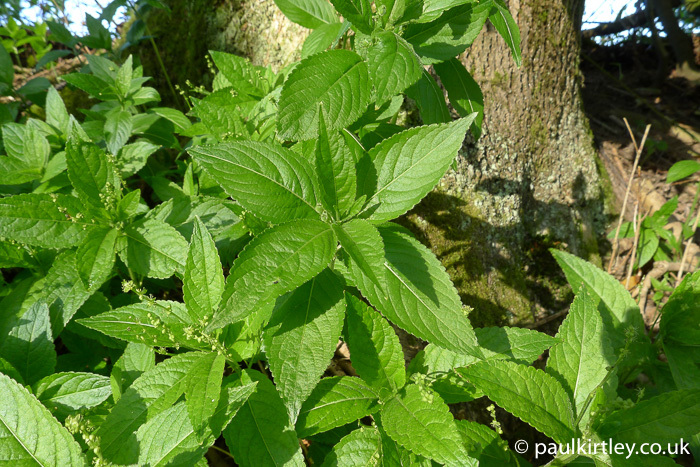 Dog’s mercury is a common plant of woodland floors in the UK and Europe, often forming continuous stands. It is not the most showy of plants and it is generally unknown by most people, even though they may see it every day while walking their dog in the woods, for example. Dog’s mercury is most prominent in the spring. At first glance it somewhat resembles a mint but it has some significant differences both in the leaf arrangement and the flowers. Mercurialis is one of two genera of the large Euphorbia family, that contain species native to the UK, both of which contain toxic species. Dog’s mercury is by no means one of the most poisonous plants you’ll find in the woods but it is very common and should not be ingested. Learn it so you can differentiate it from more useful species of plants you will find in the same habitats. Dog’s mercury is a common forest floor plant. Photo: Paul Kirtley. Foxglove is a plant that makes its presence known. The imposing flowering stems, holding beautiful purple bell-shaped flowers are obvious to all. What is less well known is that foxglove is a biennial, which means the plant completes its life cycle over two years. In the first year, it produces a broad rosette of leaves, close to the ground. The easy-to-spot purple flowers appear only in the plant’s second year. Hence, it is much less well-recognised in the first year. 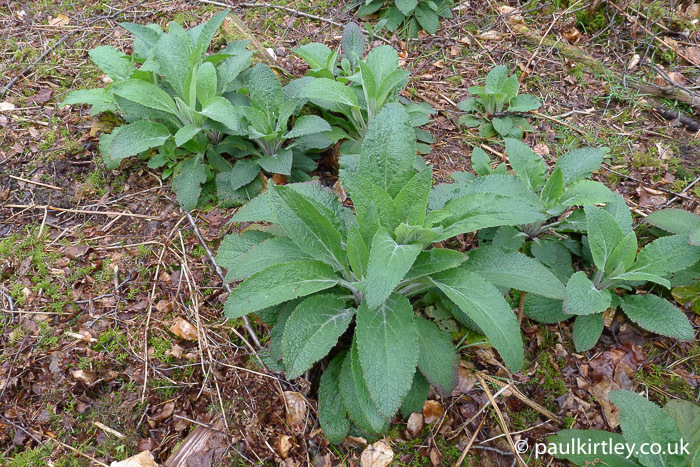 You should learn to differentiate the leaves of foxglove from other useful edible or medicinal plants such as burdock, mullein and comfrey. All parts of foxglove plants contain powerful toxic alkaloids which act on the heart. Human poisoning has occurred following consumption of the leaves and flowers. Some people use the plant as a toilet paper but this is not to be generally recommended as skin reactions have been reported following contact with the leaves. Leaf rosettes of foxgloves. Learn to differentiate between these and useful edible or medicinal plants such as burdock, mullein and comfrey. Photo: Paul Kirtley. Giant hogweed originates in central Asia and was introduced to the UK and western Europe as an ornamental. It contains a number of toxins, including chemicals which cause dermatalogical reactions when in contact with human skin. These reactions can be particularly severe when they occur in bright summer sunlight as the toxins make the skin more sensitive to UV light. This photosensitising sap has been increasingly reported in the news as children are typically the ones harmed. That said, the reactions are not limited to children and people cutting the plant down or, even worse, strimming it, spattering sap on their unprotected skin, have had blistering. Eyes can be damaged by getting the sap into them. Clearly care should be taken around this plant. When it is small, the leaves are quite light green in colour and can be differentiated from other related species, in particular common hogweed, Heracleum sphondylium. When large, the plant is similar to many imaginings of the fictitious triffid and cannot be mistaken for anything else. These plants are becoming more widespread in areas they have been introduced and seem to favour damp ground, particularly the banks of rivers and canals. 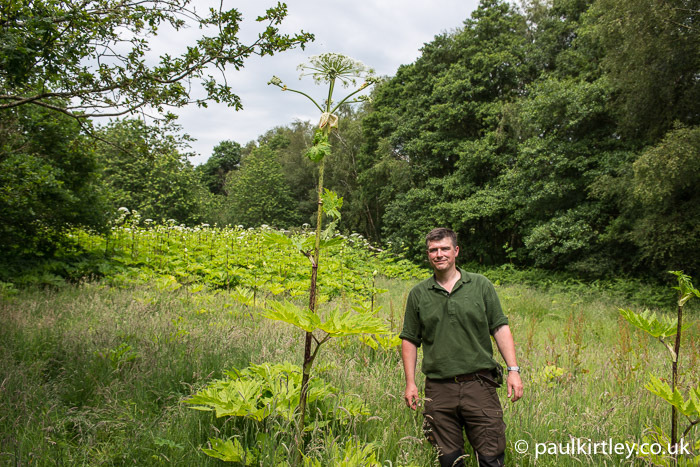 The author standing next to a specimen of Giant Hogweed. Photo: Paul Kirtley. This is the classic “poison hemlock”, which many have heard of but far fewer know how to identify. It is important to be able to differentiate this from other less noxious members of the carrot family, to which this highly poisonous plant also belongs. The leaves of hemlock are lacy, feather-like structures, which resemble the commonly known cow parsley. Hemlock has purple splotches on a relatively robust stem, which is round and hollow. The leaves are somewhat finer and more frilly than cow parsley but the differences are relatively subtle. Some people say hemlock has an odd unpleasant smell but personally I find this unreliable. Learn the external features of the plant, including leaves and stem, for positive identification. Hemlock has caused fatal poisonings following ingestion. All parts of the plant contain toxic alkaloids, including coniine and gamma-coniceine. Parts of the plant that have caused poisoning by eating include the seeds, the leaves and the roots. Potency of each part varies with climate and season but if ingestion of any part of this plant is suspected, urgent medical treatment should always be sought. Signs and symptoms of hemlock poisoning are reported as burning and dryness of the mouth, followed by weakness in the muscles, eventually leading to paralysis and difficulty breathing. Also pupil dilation, vomiting, diarrhoea, convulsions and loss of consciousness have been recorded. Death occurs due to respiratory paralysis. Lacy leaves and purple-spotted stem of Hemlock. Photo: Paul Kirtley. Hemlock water dropwort is another poisonous member of the carrot family, Apiaceae. This is a plant of wet woodlands, riversides and ditches. It has multiple toxins, including oenanthotoxin and linear furanocoumarins. This plant is more common than you might think. Once you know it you see it in many places. In the UK it tends to be more in the south as well as the west and I have seen it extensively in mainland Europe too. Some of the toxins are photosensitising, so you should avoid contact with the plant and the plant should also not be ingested as it is highly toxic if eaten. There are numerous documented cases of fatal plant poisonings from this plant and its relatives, which contain similar toxins. 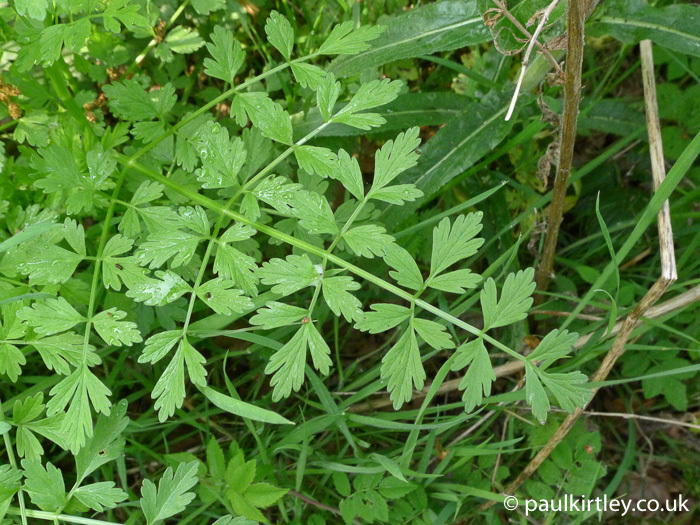 The leaves resemble flat-leaf parsley or coriander and the roots resemble parsnips. The roots contain four hollow chambers, though. Do not mistake these for other edible roots in this family such as wild carrot, Daucus carota. 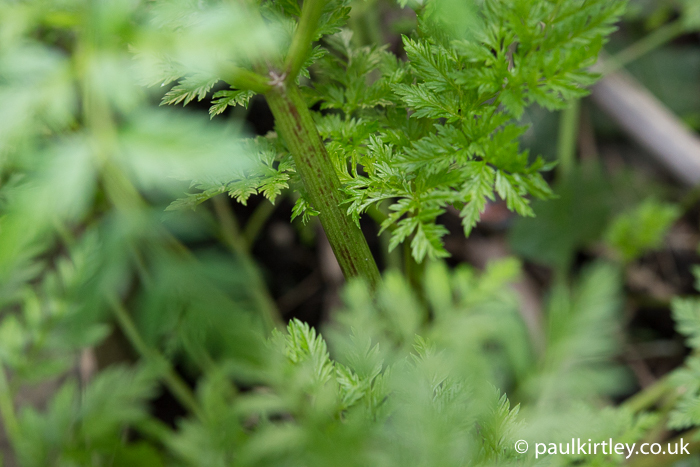 Leaves of hemlock water dropwort resemble its familiar cousins, coriander and flat-leaved parsley. Photo: Paul Kirtley. The flowers of hemlock water dropwort. Photo: Paul Kirtley. Arum is one of the first leaves to emerge in the spring, racing to collect sunshine ahead of the trees coming into leaf. 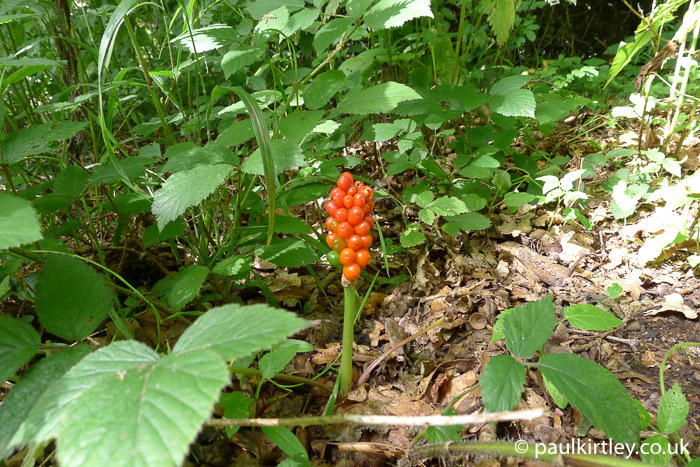 Also known colloquially as cuckoo pint, this plant is in flower in the early spring with its distinctive sheathing bract, enclosing the flower, reminiscent of a mediaeval cowl. Later in the year, from mid summer onwards, its spike of berries, ripening from green to a vibrant and attractive red make its presence known from a distance. Despite the attractiveness of the fruit, some saying they resemble jelly bean sweets, these berries are not for nibbling. Like other members of the Araceae, Arum maculatum contains calcium oxalate raphides, sharp crystals that easily puncture the mucus membranes of your mouth and throat, causing intense irritation and soreness, plus creating an avenue for other toxins to enter. Some cases of skin and eye reactions to contact with juices of the plant have been recorded although handling the plant is relatively low risk. Poisonings have occurred due to consumption of the leaves and roots but it is the berries that most commonly cause an issue. If you have children, be particularly aware of these plants as they are low down to the ground and the berries are a very attractive colour. Fruits of arum. Attractive like jelly beans but much less edible, these grow on a stalk low to the ground. Photo: Paul Kirtley. 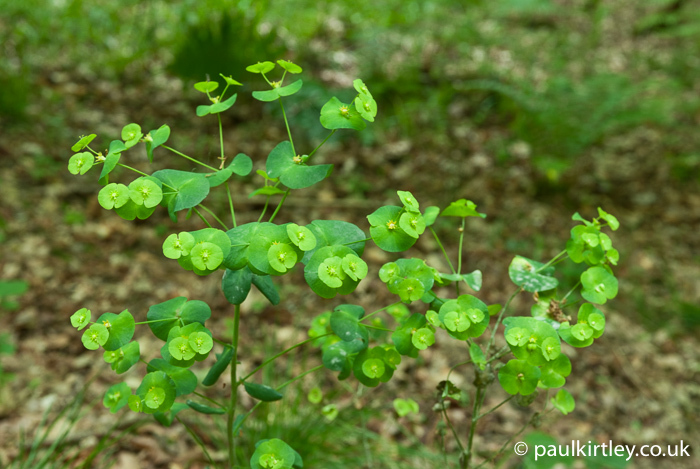 Along with dog’s mercury, mentioned earlier in this article, woodspurge is the another common member of the family Euphorbiaceae native to the UK. Like other members of the genus Euphorbia woodspurge is quite a primitive plant, with relatively simple flowers that hardly look like flowers at all. The sap of woodspurge is milky and caustic. Like its African relatives such as the candelabra euphorbia, the sap of this toxic plant was once used to remove warts. You do not want to be handling or ingesting this plant. In the UK the distribution of Euphorbia amygdaloides is a relatively southern one, but where it occurs it is quite common. The lower leaves of the main stem are not dissimilar to the edible rosebay willowherb, or fireweed, Chamaenerion angustifolium, so if woodspurge occurs in your area, make sure you can identify it properly. The primitive flowers of wood spurge. Photo: Paul Kirtley. Most often seen on the edges of ponds, although not exclusively, this plant has long strap-like leaves, which are superficially similar to edible species Typha latifolia and Typha angustifolia, the cat-tails. The sap of irises can cause dermatitis on contact with the skin and the roots, while resembling a hairy sweet potato, are toxic if eaten. The delicate and obvious yellow flowers make for an easy differentiator but clearly are not present for most of the year. The plant can also be differentiated by the leaf structure. It has a single diamond-shaped rib down the centre of the leaf, which is otherwise paper-thin. Typha species, by contrast, have a leaf cross section which is entirely crescent shaped. 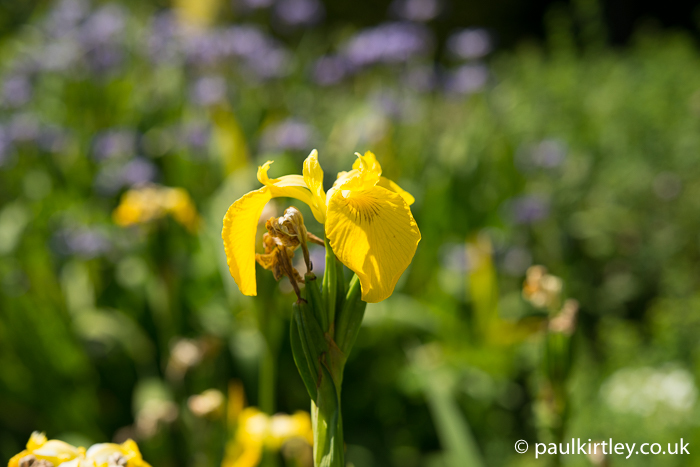 The flowers of yellow iris make it easy to identify and distinguish when in bloom but make sure you can ID this plant at other times too. Photo: Paul Kirtley. Well, the above is your starter for ten. These ten species are widespread and it is highly likely that some grow near to you, even if you are living in a town. 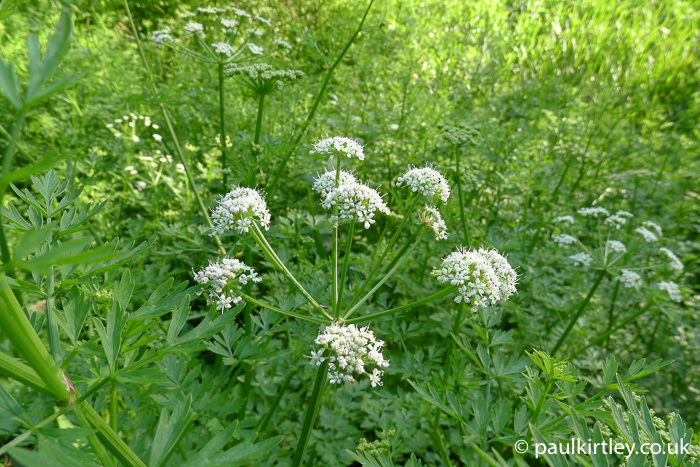 I have seen poison hemlock growing in central London on several occasions and many of the other plants growing in parks. yup, know all those ones. I know them all, but reckon my children could identify 6-7 of the ten. It doesn’t say how poisonous they are. Thanks for the information, as someone who lives in Australia im sure to not find a lot of these. However it was a good read and I have added pictures of these to my walking book just in case. I am just starting out on foraging so any information is helpful. having always prided myself as being quite knowledgeable in the bush, I am finding over the course of the last year or so the importance of reading and seeking out more information as I clearly didn’t know as much as I thought I did. I’m really enjoying all of the resources you have provided. Some is familiar and some is defiantly not. Thanks again. Thanks for your comments. I’m glad you are finding this site useful. While you have your own distinct flora in many ways down under, there are even connections here with the few species mentioned above. Some European species have been introduced there plus there are indigenous species such as the Kangaroo apples, including Solanum aviculare and Solanum lacininatum, which bear some family resemblance to European members of the Solanaceae, such as Solanum dulcamara, which is featured in the above article. Getting to know one, helps recognise the other. There’s always more to learn about plants and this, in large part, helps keep it interesting. Very important and useful content. Thanks for your comments Paul. Best to be safe rather than sorry. Great info as always Paul! Thanks Jeremy. Glad it was useful. Got most of these growing in and around the wood. Good informative read. Glad you found it informative Dom. Cheers. Glad to hear it Steve. Good post !. Maybe you can add ricinus. With the Lords and ladies, it can be easy to get carried away when picking wild garlic and get some of this in with it. Whenever collecting wild garlic with my daughter I always looked for some Lords and ladies first, to remind her what they looked like. We then checked through our harvest carefully to be sure. Knowledge on the poisonous plant is the vital skill required for survival during adverse situation. Great sharing. Indeed. One should know all the most potently toxic plants in an area of operation. Thank you for your comments. I’m glad you have found material here useful. If you would like some higher resolution images of photos on this blog, please let me know the details of what you want. Most of the photos here are compressed and sized perfectly for the web but will be too small for use in a presentation.